Not to be confused with a similar device, PlayPal Plug & Play. 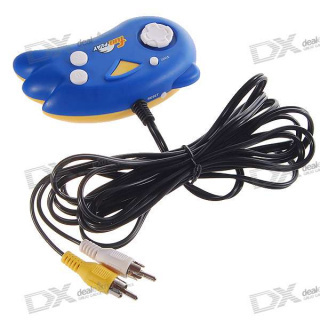 Freetron’s FunPlay 20-in-1, is a Plug and Play game console released in 2009, licensed by Atgames (who exclusively manages Sega's first party platform game library), and manufactured and distributed by Freetron. It's very similar in design to PlayPal Plug & Play (including the same button layout) and by being a Sega Master System / Game Gear emulator. Though they share a significant number of games, they differ by using 3 AAA batteries and a directional pad instead of a joystick. User reviews state that the materials are of good quality and that the controls are responsive. This page was last edited on 25 November 2011, at 14:27.